This past summer I decided I needed another side table in my living room. I had rearranged and moved the side table to the other side of the room. So I needed something to take its place and to put my lamp on. It didn’t work to move my lamp along with the side table because I needed the lamp beside my favorite chair. I wanted something taller than a normal side table, and I wanted it now – it needed to be something I already had. I briefly considered stealing one of the end tables from our bedroom but neither of them were tall enough. 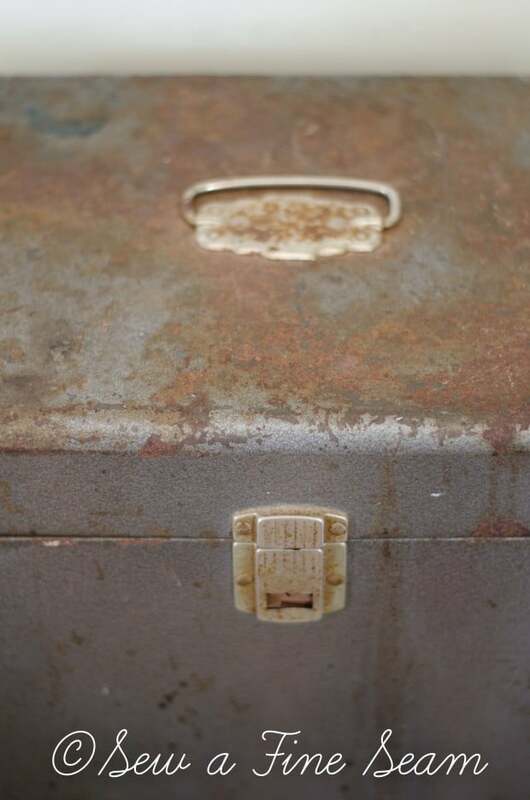 Then I happened to remember that I had a cool metal cabinet sitting in the garage awaiting its turn for a makeover. The cool metal cabinet immediately got hauled to the house and cleaned up. 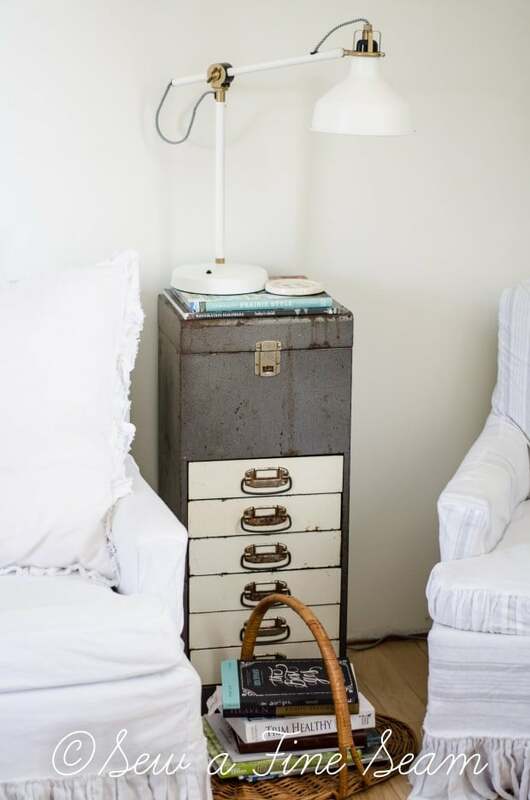 Because a cool metal cabinet as a side table was exactly what this room needed! A bit of rust isn’t going to hurt anything anyway is it? Why bother painting – at least for now. I loved the piece in the space and the height was just right. The only problem was the handle on top. Now the handle really isn’t a problem since it is necessary for this piece to be fully functional. The top opens up to a space for storage above the amazing stack of drawers. But I wanted to set a lamp on the top. And lamps don’t sit well on an un-level surface. After thinking about it for a few minutes I dug a Restoration Hardware catalog out from the bottom of a stack of magazines, and cut a square through a bunch of the back pages. 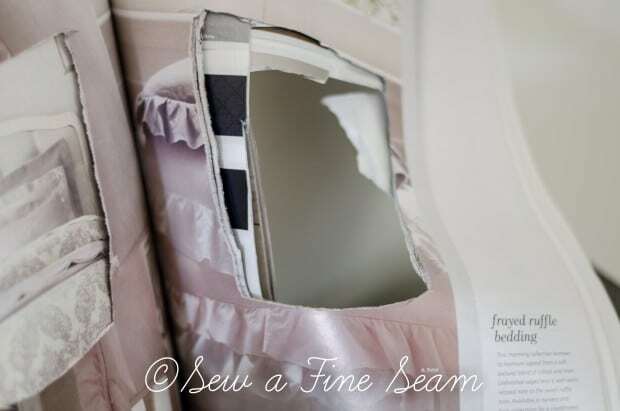 It wasn’t overly neat – I just made sure I cut an opening and cut through enough pages that the catalog would lay flat when placed on top of the handle on the cabinet. Viola! Perfectly flat. But a bit less firm a surface than needed to set a lamp on. 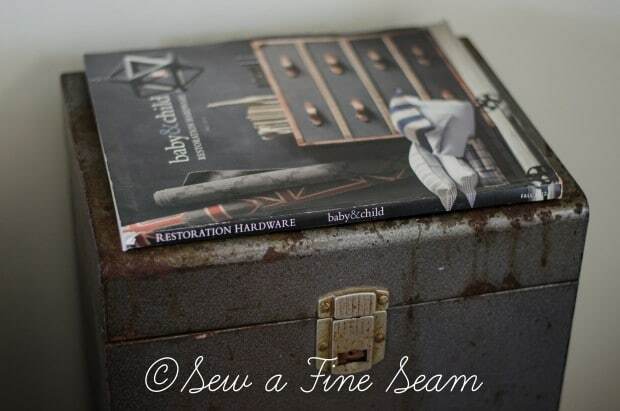 Add a hardback book on top of the magazine and now I had a flat, hard surface that was just right for my lamp. I even managed to find room for a coaster so I could set my coffee or ice water beside me. And it’s been working perfectly ever since! Do you have any odd pieces of furniture you’ve had to get creative with to make work?! Love it! Such a unique piece! Thanks Lisa, I’m loving it so much! what a great idea! I never would’ve thought to cut out a section of the catalog to fit over the handle. That a great looking industrial style cabinet. 🙂 I knew I had to make something work because I loved it there but I also knew I had to be able to put my lamp there! You are so clever and industrious, finding solution for your new table. It’s wonderful with all that storage with the drawers. Do you have drawers full? I’m sure I would. The height is perfect for your chair and what you needed it for. 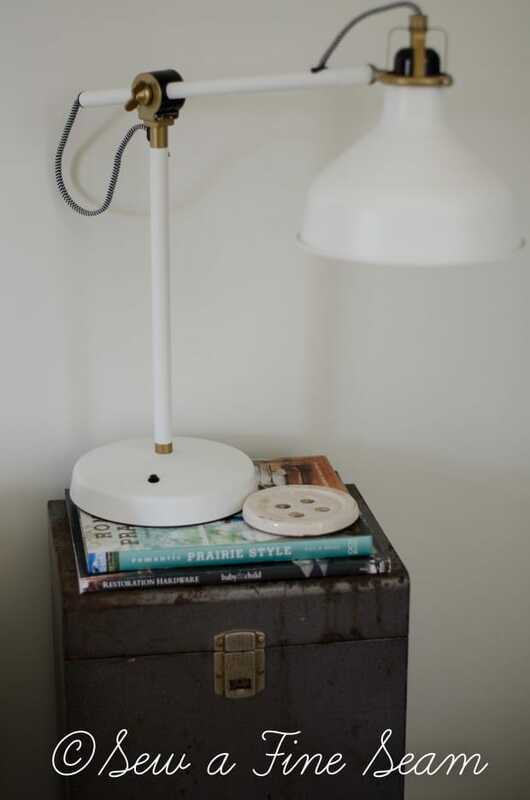 Love your lamp, great for reading or sewing. Do you do that in your chair? Have a great week, no sense telling you not to work too hard cause you will anyway. Hope all is going well with your merchandise at that antique store. Yes, JaneEllen, if I have handsewing to do I do it in this chair! I also do my morning reading/coffee drinking here. And my blogging. And turning pillows 😀 And no the drawers are not full yet – I’m sure they will be eventually! Thanks Susan! It not only gave me some storage (the remotes and the kids school dvd’s hang out in one drawer) but it added just the right industrial touch to the room too! Charming and perfectly rustic! I have that same lamp and love the way it looks. 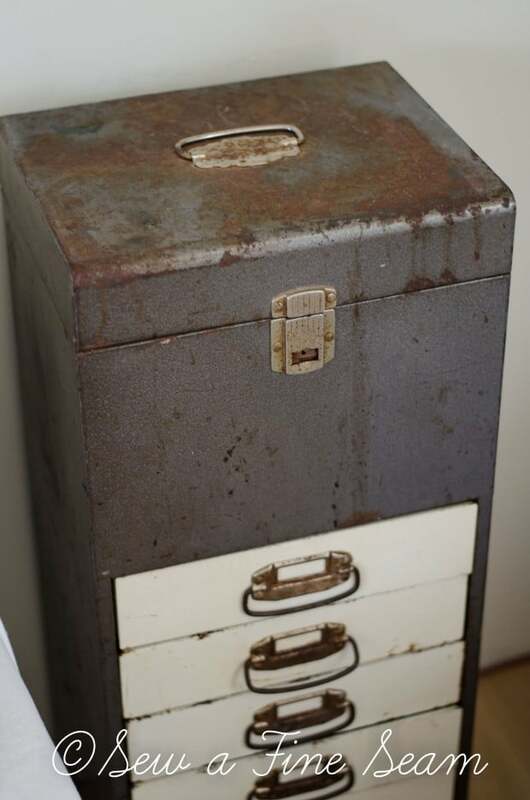 i have this same exact filing cabinet I found it on a river bed next to my sisters house! I love it glad to see another one in use in the wild!! I have the same metal cabinet (although the drawers are not white, but the same as the rest of the cabinet). My parents had it in their bedroom when I was growing up and kept important papers in the top and misc. in the drawers. They gave it to me years ago and it’s still in great, almost like new shape. What fun Kate! I love the industrial look and the functionality of this piece! 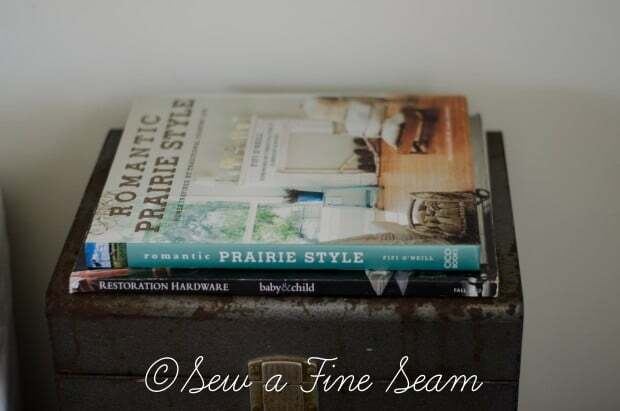 Your side table looks so cool! 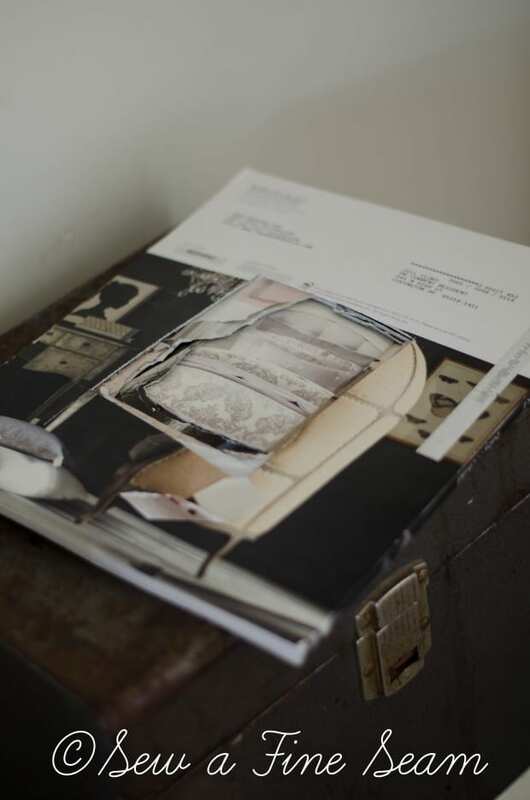 I love the mix of materials you’ve used and what a clever idea with the magazine! Really pretty! PS Saw you over on Miss Mustard Seed. Thanks Sally! I love my side table a lot! Jill – seriously – if you ever want to sell it – let me know!